Holidays are here again! Time for shopping, Christmas lights, and extra bunny cuddles. Our super-sized issue reaches a whopping 88 pages and is incredibly full of content. I could get descriptive with each of these sections but I’d rather you read the issue than have a super long facebook post. So download now. As usual, it’s free so please download and share. Happy Birthday to us! Bunnyzine turns 3!!!! November 1st, 2014 we launched our first issue. 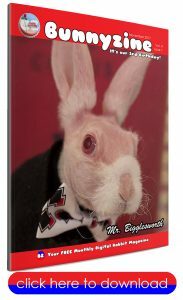 3 years later, we present to you as our featured rabbit, the amazing internet sensation, MR. BIGGLESWORTH! Check out our interview about him with pictures and even links to his fb page, website, and shop. We also have an amazing interview and pictures of Miracle, a bunny who saved a couple from a burning home while Miracle was trapped inside for 2 hours and survived! The issue also has the beautiful rescue story of Finley, an article on the Ontario Canada Rabbits Facebook group, Fan art, A review on the new Ears O’Fluffin book, Part 2 of our Australia article in the Rabbits Around The World series, coverage on the HRS Educational Conference, an article on pregnant rabbits, and two pictorials: Midwest Bunfest and the VRRA Rabbit Fest. All of this is crammed into a large issue celebrating the start of our 4th year! 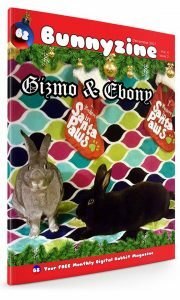 We are very pleased to have brought you 3 years of Bunnyzine and we have some great things coming up for the 4th year. We love having you as our reader.